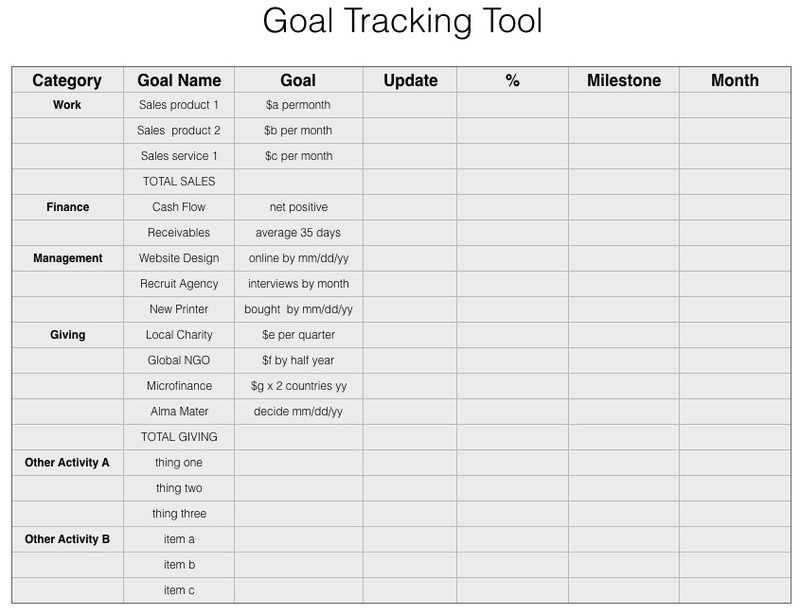 Goal Tracking Tool: Here is a very simple goal tracking tool I devised. You can copy or adapt it for your own use. You can print it or, better, keep an electronic version on your desktop so you can keep it regularly updated. The pundits say goals should be SMART: Specific, Measurable, Achievable, Realistic and Time-bounded. They certainly should not be pie in the sky or so easy that you cannot fail. Many moons ago I participated in a workshop run by a Venture Capitalist firm for potential investees, where we played a game of horseshoes with betting on outcomes. There were three ’rounds’. The most unadventurous stood over the first peg and dropped their horseshoe on it. The most timid of the timid repeated this three times, preserving their starting money. The most reckless hurled their horseshoes at the furthest peg and missed three time, losing all their wagers. In the middle were one or two like me who started adventuresome and progressively reined in their aim in their second or third shots to make a reasonable winning. Whatever the goal is, it is not enough just to define it. You need some sort to goal tracking tool to see how things are turning out. You are unlikely to get a goal in one shot, so there will be steps or milestones along the way. So a spreadsheet or a simple chart like the one below will help you. The purpose of this simple goal tracking tool is to give yourself a means of monitoring progress and to try to avoid surprises. Despite what some people will tell you, goal setting and tracking is a very imprecise science. In fact it is more art than science. May you succeed where others fail. I suggest you use the simplest goal tracking tool you can. If you use Evernote, it has a goal tracking facility, or there is the free goal tracking tool, Wunderlist that you can try. Venture Founders has other tools that help with goal tracking: the Five Whys Technique, SWOT Analysis, and the Milestones and Accountabilities Chart.